In late May I delivered the second Storytelling for Women Leaders workshop, this time in Melbourne and it was brilliant: intense, full, extraordinary, and mighty amazing. Again I was confirmed in the power of the work, and again I learned so much about the teaching process. I tried a new Storytelling Game and it was great addition to the workshop (and will be even better with a few changes for next time), and I introduced other changes that I think are great improvements to the workshop process. It is now much more streamlined and clearer in its stages and what is achievable in the time frame. This time I did not give individual feedback within the workshop itself and so added an extra coaching session with women to workshop their individual stories. This has been a much better outcome as this perosnal one on one work is simply too time consuming to do for each person in the workshop, and it is so satisfying for me and the participants to be able to go really deep with their story after the workshop. The level of understanding of story and the crafting processes is so much greater with women who have done the workshop. In early June I did two jobs in two very different organisations, all around story, but each a different aspect. A lot of work thinking round and round and round about how to best approach the task to achieve the aims of the person in the organisation who is sponsoring me to come in, and no matter how far I stray into other processes I keep coming back to story, circle, and play (if I had my way i'd also add in mindfulness). It has been a huge opportunity and much learning for me. All this work has meant that my social media postings have fallen away and even this 'wrap' is being banged out in record time, so I can race back to Joan. Aaaah Joan, Joan of Arc that is. She has been my constant companion for the last month. I have been reading and researching deep into her life in order to somehow wrestle the entirely of it into a story. It is down to the wire now and so once this enews is done, the decks will be (almost) clear for me to get back to Joan - and Red and Demeter, and Ruby and Sophie - all the women and girls of the stories I will be telling in the week of the solstice for Fantastic Feminist Folktales, which I am very happy to is sold out. It has been a favourite saying this month, that when you have a hammer, everything looks like a nail. I feel like that with story, there does not seem to be a situation where story is not my answer. Hope you are enjoying a story filled month. 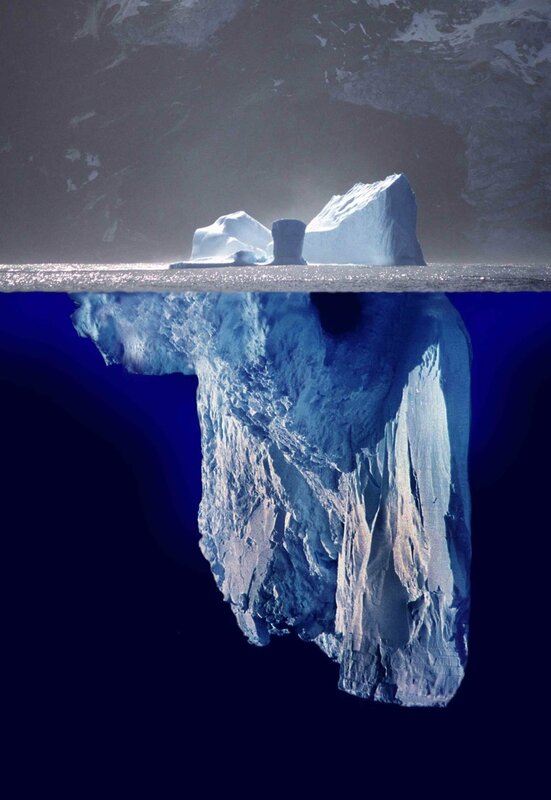 It feels like an iceberg month at Story Wise, one of those months with not much showing above the surface, but under the water there is a whole world of action. I am starting to prepare for work within organisations, using story and circle to connect teams, enable emotional expression, greater understanding and deeper relationships. The theme for Story Wise Musings in May (AKA blog posts) is story facilitation, so this is apt. I am also hopeful of securing work with a not-for-profit to develop their capacity to tell and use storytelling in their work in the community to advance gender equality. I am looking forward to delivering the Storytelling for Women Leaders two day program later this month, in Parkville and with 7 of the 8 spots filled it promises to be a wonderful two days. I am really keen to finesse the program and its delivery and build on the lessons and feedback from the last time I delivered it. It is deeply rewarding to see the women blossom as they craft, practise, refine and reflect on big and little stories. Work continues on the two new initiatives for June, the new open mic event Story Wise Working Women, at lunchtime in the CBD. There will no doubt be a different feel for this event, in a daytime venue and with a lunchtime crowd. I am looking forward to seeing the women and the community that will develop, cos’ thats just what happens when you share stories! And I have been thrilled by the positive response to the ‘Fantastic Feminist Folktales’ night of stories I will perform for Winter Solstice. As a first solo ‘show’ it is exciting and terrifying in equal measure, but with Joan of Arc for company as I prepare, I really can’t justify the word ‘terrifying’, given her life. So lets just say it is a bit scary and exhilarating. Hope to see you somewhere at one of these events, or online in the cyber Universe. ... may have mentioned something ..
Storytelling for Women Leaders - Using values and strengths, we’ll explore personal history to find a signature personal story, then stitch it together, and polish and practice it. We’ll look at telling other types of stories as well, and how to sort and keep a story practice going. Story Facilitation: Participants will learn, experience and practice story activities and facilitation for working in groups or teams or communities, for creating shared vision, connection, understanding, and well as gathering collective organisational intelligence, (otherwise known as great listening). Storytelling for Speakers: This workshop is for those who have a speech or presentation to give and they want to learn how to weave their message with stories, and how to feel confident and speak with style. The NiDA Nights event is behind me and so I breathe a sigh of relaxation. It was lots of fun, a great opportunity to collaborate and the storytellers I enlisted from my community of Storytelling Australia Victoria were brilliant. The night was a wonderful unfolding of a really amazing and enriching range of stories. Also under my belt is my first webinar ‘How to Think Like Storyteller’ and it seemed to go well. It was great experience for me to clarify the information and present it in a way that makes the best sense I can make of it, as well as loads of fun finding and telling stories throughout. I also enjoy the creativity involved in making slides as I really like to think visually. But it is a lot of work so I will no doubt repeat the webinar at some stage, so it is not wasted and I can polish and refine the material each time. I will be holding a webinar each month until November (although you would be forgiven for not trusting this given my propensity to chop and change). While we're on the theme of trust, the next webinar is on March 9 and the topic is 'Storytelling to Build Trust’. You can register here. So now I will get back to preparing for the next webinar and for the Storytelling for Women Leaders two day workshop. I have a confession, the following was written in December but didn’t hit the airwaves, so I have adapted it for now, and hope it is still resonant. The end of the year is almost out of sight in the rear view mirror, and for us here in the Southern hemisphere, we are coming to the end of the long hot days of summer holidays where, at least for an afternoon or two, not much happened except of the buzzing of flies and human moves to get food. Where I live, the next 6 to 8 weeks are the most dangerous, as the abundance of significant bushfire anniversaries tells us. But last night a steady rain ended a heat wave, and brings a window of ease. It is also the start of the school year this week, which for me at least, will bring a freeing up of time. Summer is always a time of reflection, but my usual focus in on thinking and planning for the coming year, I rarely stop to take stock and celebrate any achievements, so here and now this is what I will do, maybe it will inspire you to the same. The big steps forward for us (i.e. me and Story Wise (I read recently that it is important and useful to separate your business from who you are? )), have been the rise and rise of Story Wise Women, giving a TEDx talk, lots of writing, reading and preparing like pupa, for transition into some serious offerings in 2018, as well as pursuing the creative art of radio/podcast storytelling. The down side was realising that Story Wise Woodend was not sustainable for me and so I will not be continuing to host this event in 2018. But I think more than anything has been a shift from feeling like I don’t know enough, have enough experience or knowledge, can offer enough, or that to offer enough I must tie myself to the wheel and move a mountain, to now feeling like I am skilled and experienced in story, and deeply so. I have something significant, useful and appealing to offer, that I really believe in. I now know when I am in the saddle of my strengths and talents. It is often a lot of work to get there, to get that ease and flow, whether its telling a story, advising or coaching on story, hosting an evening or listening to stories in circle, but these are the things that allow me to soar, even if momentarily, and that I must pursue, because that is how I am of greatest service. So now over to you, what did you want to celebrate year? How are you different now from how you were at the beginning of 2017? What have you learned? And just in case you missed it, I am currently offering free story coaching sessions, up to 45 minutes. No matter what your issue, if you think story has a part in it and want a sounding board, to get clarity and ideas, make an appointment here. It has been a big month, mostly because I passed the milestone of giving a TED talk. Yippee! It was an epic journey that had me learning right up to the middle of the speech, and as I am now embarking on the creative task of podcasting my story of TED talking, it is an adventure that keeps on giving. By the time you are reading this I will on my way to France to ‘pick up’ my 16 year old daughter who has been away since January. I am so very much looking forward to seeing her, swanning around France with her as interpreter for ten days, and then resettling my back family back together as we move towards the holiday season. Story Wise story telling nights have finished for the year. I was unable to attend the last Story Wise Woodend and Ann Bolch kindly stepped in to host. It was a small gathering, as was the October night, which is in part why I have decided not to continue hosting the event. I love the community that has developed, but the numbers make it not sustainable for me to keep going. Story Wise Women, on the other hand finished the year on a wonderful high, with a full list of tellers, a full house of listeners, great stories and much hilarity. And of course there was meaning making, warmth and laughter, connections and conversations. We will return with more events in March 2018. The Story Wise website has had an overhaul, with greater clarity around the work I do. I am keen to do more work in organisations and communities, using story sharing to patchwork together an overall story, for peer leadership support, to process difficult events, to build culture and connection and as a way of enabling emotions to be acknowledged in the workplace - to be expressed, shared, processed and embraced, a counter to the overwhelming levels of workplace disengagement. This is the subject of the latest blog post. I am also stepping up to develop my place as a speaker, on the topics storytelling, and its role in self awareness, connection and persuasion, the topic of emotions and emotional expression at work, and the impact of the simple but powerful tool of circle process to create connection and participation at work. So if you are looking for a speaker, please contact me, at this stage I am almost free! I am also offering a Speakers Retreat, an individual and intensive program for women with significant speeches or presentations coming up. The idea is you take a couple of days out of your routine, and we work together, in between you writing, working, researching, thinking, walking and whatever you need to do to think deeply about your topic, and prepare to give a great speech. And the details for Spiral Wise Impact, the flagship women’s leadership program are now up on the website here. Still much work to do over the summer to refine details and offerings, but next year is to be a year of being out there! Hope you can join me on the journey. It has been two month since my last enews and a lot has been happening at Story Wise HQ. Right at the minute, I am a wee bit jittery as its three days until I present a TEDx talk in Bendigo. My topic is naturally enough the power of storytelling. On Sunday, as soon as I had it nailed, I decided to overhaul the whole thing! I have just re-written what I sincerely hope will be the last version, now all I have to do is learn it! I am hoping to do more public speaking work on the back of this, so if you’re looking for a speaker, get in touch. The storytelling nights have been ticking along with Story Wise Women booming and Woodend going from being one extreme of a good size crowd one month, to last month being a very small crew. Next month for Story Wise Women we will have filmmaker Mojan Jivadi along to film (if tellers would like) stories from our childhood. A full explanation of this new theme is elsewhere in the newsletter). In another spin of the iterative business cycle, I am pivoting a little in my focus, not away from storytelling, but adding in women’s leadership. Next year I will offer a new program called Spiral Wise Impact: Inner and Outer skills for women change agents. It is a program for women who are fighting the good fight from the inside or leading a change-the-world cause from the outside. It is for women who want to develop confidence, be able to be seen and heard, get their message across and lead and inspire strong teams and collaborations. The program will explore and develop emotional intelligence, storytelling, facilitation and public speaking skills. If this is something that interests you, I would really appreciate your input, either through a survey I have created on Facebook or a phone call. I really want to explore what you and other women you know, are struggling with at work, and how I can best tailor this program to meet the needs of women in organisations. There’s a free ticket to November’s StoryWise Women for anyone who gets involved. And if this isn’t for you, rest assured, storytelling nights will continue to keep the good stories coming. The other direction I am heading, which I am excited about is, audio storytelling, not the kind like Story Wise Woodend, where a story is told before a live audience and then published as a podcast, but the kind where the story is narrated, with sound effects, music and real time conversations and commentary. My first idea is a series of about 6 episodes which tell the story of giving a TEDx talk. Of course as Story Wise faithful subscribers, you will be the first to know when it hits the airwaves. In the meantime, if you are in or near Melbourne, I hope you are enjoying the brilliant Spring weather we’ve been having, otherwise, I hope the sun is shining wherever you are. My first professional job was as a community lawyer at the North Melbourne Legal Service. It was the job I imagined having all through my law degree, it was my dream job. In that job I was required to write a monthly report and which was always a chore, a time where I had to stop my forward momentum, to think about the past, assess, count, report and comment on where my work was going. The report was for the monthly meeting of the volunteer committee of management and the report was really all they had to go on to know what was happening in the place they were responsible for. All of this is by way of saying this little Story Wise wrap of what I’ve been up to in over the month is similar. But even though I begrudged doing the legal service monthly reports, when it was done there was a level of satisfaction, a moment in time to stop and appreciate the progress that had been made. And I grew to enjoy them. So I will imagine I have a Story Wise committee of management, and in the spirit of those legal service reports, here is my report for the month for Story Wise. The new venue for Story Wise Women was a great success. We had about 35 women attend and ten stories, and Katrina and her sister, who manage The Good Room, put on a wonderful supper and set the room up beautifully. The event is gaining momentum and a following, with a little help from Facebook ads, but gee Facebook ads beat walking the streets with flyers. Story Wise Woodend was beautifully hosted again by Ann Bolch last month and it is very nice to hand over the reins every so often. I am still beavering away writing: I have the footy piece back at the drawing board for a complete redraft, a storytelling workshop manual being chipped away, plus a public speaking curriculum, the TEDx talk, as well as a story for the monthly story nights. It might sound like a lot, but I have discovered micro habits, and it suits me very well. The aim is to write every day, as little as a paragraph for each of the projects I have on the go. This keeps the idea moving forward, the task is never overwhelming, and combined with a daily habit tracking app, enables me to be productive and focussed on a few things at a time. Last week I travelled to Adelaide to run a train the trainer day long session with some amazing women working as facilitators and coaches for women in the rural and agriculture sector of South Australia. I was training in a project I did over five years ago, called Weather The Storm: Women Prepare. It is wonderful to think of the program getting a new lease of life, and the days training reminded me of my great love of the circle process for any kind of group meeting. Teaching circle work will become part of a women’s leadership program I am starting to plan for next year. More on that to come. So I know there’s not many statistics here, and don’t think I haven’t noticed - no files opened, no new clients, no contracts signed, but I am thinking about it, a lot, and I will be adding a new micro habit to the list, ‘developing offerings for next year’. The month of July at Story Wise has seemingly evaporated. A couple of days at Victoria’s first Creative Summit, another day out that promised to have me speaking my way to success, then school holidays, and whoosh, the month has gone. In the background I am working on a personal essay about my years playing footy. The personal essay is a writing genre that I love. It combines memoir with ideas, beliefs, observation and persuasion, and in structure is quite similar to public speaking. Speaking of which, I will be giving a TEDx talk in Bendigo in October, about personal storytelling, connection and ancestry, and so I am in the middle of wrestling this mass of story experience and thinking, into a concise, story filled, logical, informative and inspiring speech! No easy task. Both storytelling nights continue to grow and be appreciated by tellers and listeners alike. I have been struck by a parallelism the nights have to a football match. Well you may wonder how they are related - it is the unknown and unfolding nature of each story night, co-created by the participants, that reminds me of the unknown outcome of a footy game. It is how the theme and motifs recur at unlikely places through the night, and how the night becomes a whole new story, made up of stories. I am really enjoying writing at the moment and want to clear the decks so I can do it as much as possible. Which means giving up something else, and in the short term that something is podcasting. So this week will see the Story Wise Woodend Pause Podcast episode and then … a pause, probably until the end of the year. I will keep recording, dividing and saving stories from the nights, until I, or someone else, is ready to create a season of podcast stories. (If you’re interested, drop me a line). Until next month, catch the stories as they unfold.